ambiguous, serious and revealing, some visualizing the fall of man and death. He seeks the trivial and, using plain coating paint, common ground with folk art, with the world of show people, of the panorama and the shooting gallery. Yet the result is not a circus, when he sets up his sculptures, and in spite of the simplicity on his topics Taucher never is banal. The mountains are part of his life. He collects minerals, studying them under a microscope; for him, mineral nature is a sort of home, and this one should really know before viewing his work, although at times it is not hard to tell from his images that this is where his interest rests. 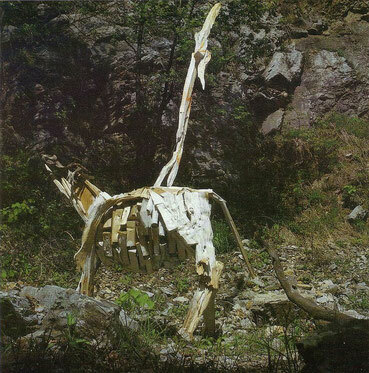 The sculpture „Jackdays Circling Around the Peak” clearly demonstrates his skill with wood and paint. A cloud bank is slanting against jagged peaks. A clouded peak rises monumentally before our eyes, we see it like a real mountain from great distance. At the same time, we ourselves are carried into glacial regions, feeling as if looking from one peak to the next. How else could we recognize the plain, dark shapes of the jackdaws? In the “Crashed Cloud with Blue Titmouse” Taucher erects a slender cloud rising to the sky before our eyes. We see it as if looking down from a mountain peak. It is not even that far away – after all, we distinguish a blue titmouse sitting on a small extra cloud (or is it mere fog?). The mountain thermionics and the artist sitting on a precipitous ridge unite in a great fall, in an immediate dramatic experience. But Taucher has mercy on us. With a smile he shows us that blue titmouse enjoying the sun and its warmth on its plumage, having a great advantage over us. The bird struggles against the crashing descent of the cloud and against the thermionic dangers, and the small cloud it sits on offers at least a visual foothold. One can even escape a natural disaster if one is not too heavy and awkward of body. This is where the hope, the chance of survival and the humor of the artist are placed, who conveys to us his optimism. Wilfried Skreiner: Josef Taucher's Mountains World. Visitors. In: Ausstellungskatalog Los Angeles Summer - styrian autumn 1985. Wilfried Skreiner (1927 -1994 ), für die internationale Positionierung österreichischer Künstler bedeutender Kunsthistoriker, Kurator, Universitätsprofessor, langjähriger Leiter der Neuen Galerie am Universalmuseum (vormals Landesmuseum) Joanneum Graz.